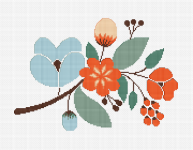 Wonderful composition of a flower branch in a muted palette of violets and reds. Flowers are the pledge of fruit. Cross stitch of pink cyclamen flowers in a white pot. Beautiful yellow tulips on a light background stitched with just five colors of floss. The gift of a tulip is a declaration of love, the flower's black center representing a heart burned by passion. 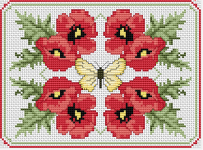 Butterfly surrounded by red poppies.A beautiful composition to decorate your walls. 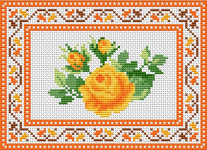 The fairest rose at last is withered.Beautiful cross stitch pattern of a vintage rose with buds designed for black fabric. White flower blossoms on a blue background. 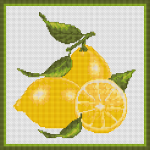 Suitable for bookmarks, greeting cards or other craft projects. Spring flowers (primula) in pink, yellow and green colors and the text: Spring. Yellow flowers, surrounded by a lovely orange border.